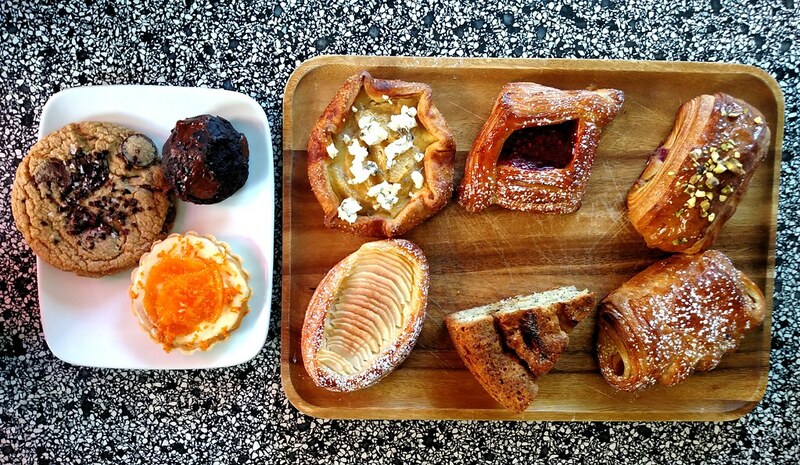 The overhead picture of the pastry tasting spread is always impressive, but I loved how the care that was put into each individual pastry is always so apparent. I’m no baker, but I couldn’t even count the layers of dough that were folded into each bear claw and danish. 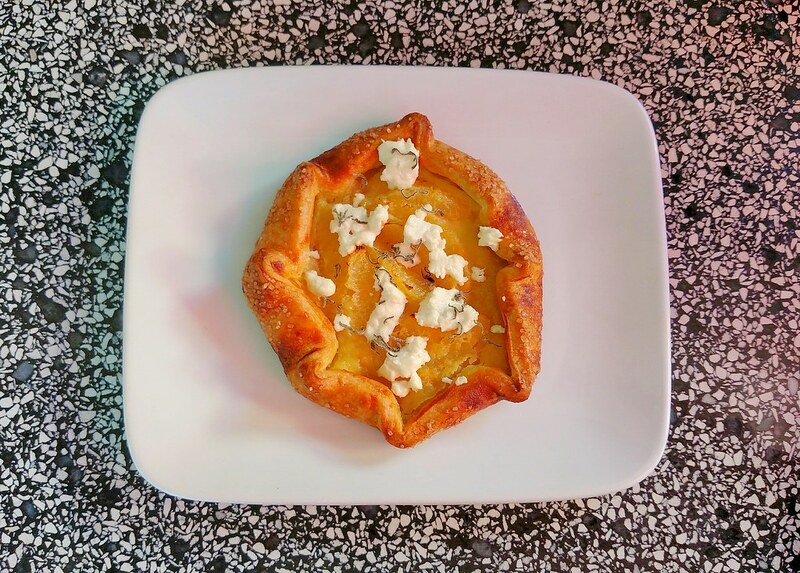 The result is delightfully crispy outer layers that break away to reveal buttery, bright and sometimes surprising flavors on the inside while featuring fresh fruit at their peak. The Fujis come from Cuyama Orchards, the tangelos hail from J.J.’s Lone Daughter Ranch, and strawberries and raspberries from Harry’s Berries. Vegans and the gluten-free can dig in to his fudge bomb, made with cocoa, coconut oil, Fuerte avocados, and brown sugar. The Fuerte variety of avocados are especially creamy, a perfect substitute for butter. I tried it and it was knock-me-off-my-feat indulgent and delicious. 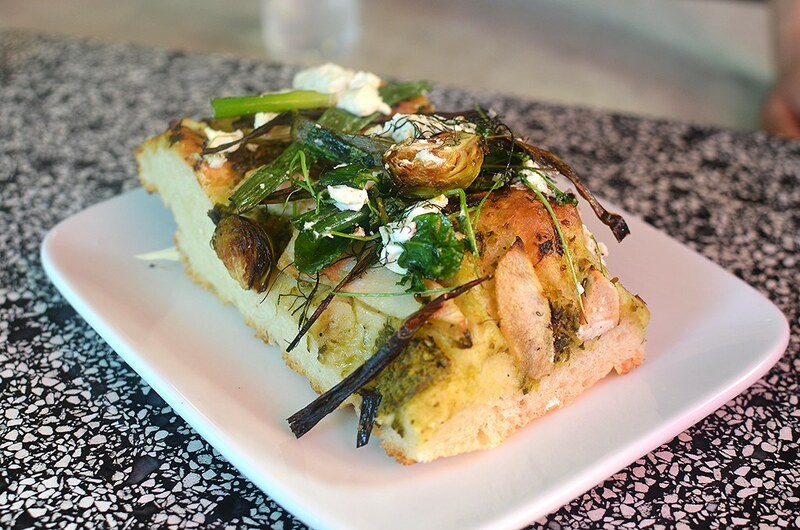 For lunchers, try the seasonal Focaccia bread of the day. 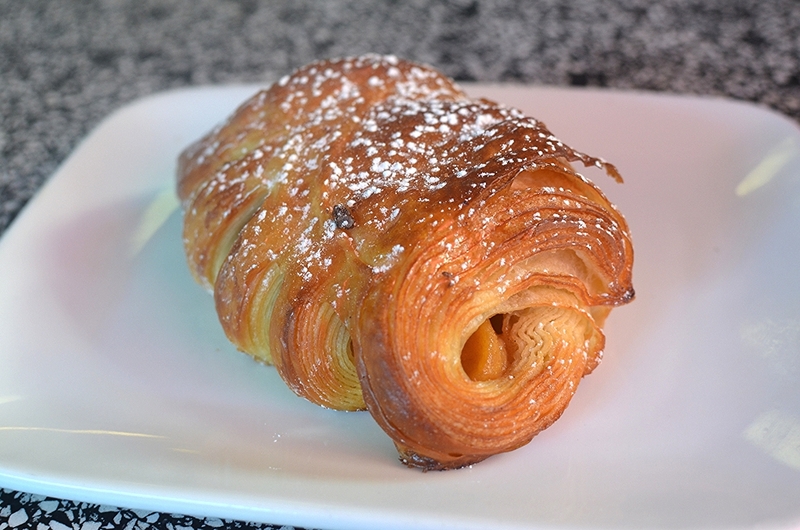 Like the pastries, the ingredients and the combination thereof, are top-notch. Of course, the Focaccia itself is phenomenal. It’s got this great crunchy bottom layer with a pillowy top that blends well with the toppings. 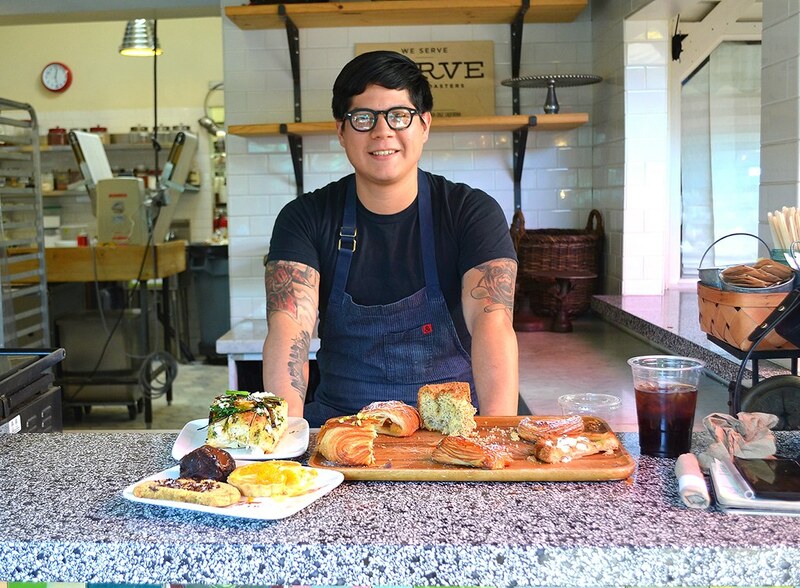 Other than the fudge bomb, the contents of the majority of pastries change every day, so you’ll have to stop by Short Cake and try Ivan’s latest creations yourself. He describes Short Cake as “a freestyle bakery” and can’t sing enough praises about his team. It’s really fun to listen to how much he loves his job, which is remarkable when he is at work every day before 7 AM, and doesn’t leave until 10 PM. It is hard to envy a baker’s schedule, but when you taste the quality of the entire array of product as Short Cake’s, you can tell how much they all love their craft. Ivan’s resume is certainly up to snuff, as well. Since he has always loved baking and cooking with his mother, as a senior in high school he decided to try his hand in a C-CAP culinary competition, where he met Sherry Yard. He spent a year under Sherry’s wing at Spago before moving to Yountville to join the Bouchon Bakery team as a Boulanger. He has since baked goods at Providence, Gordon Ramsay at The London, Bouchon Beverly Hills and The French Laundry. He recently also helped open up Barrel & Ashes in Studio City. 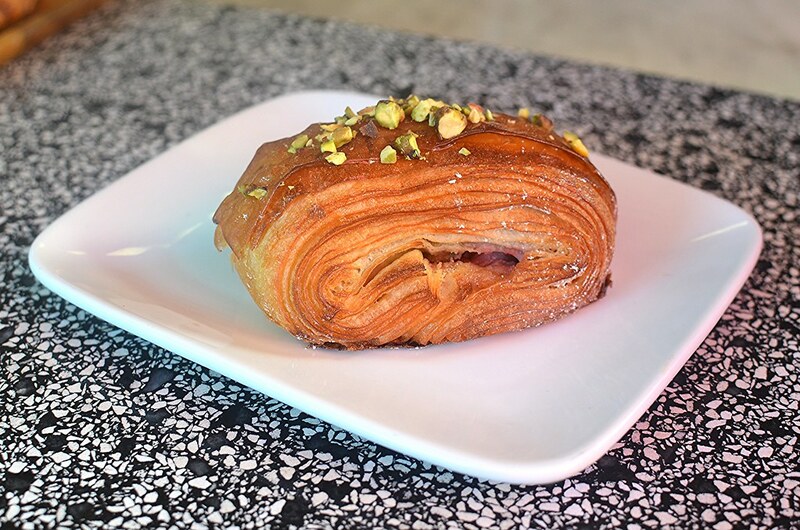 Whether you’re shopping, doing errands or really anything else in the neighborhood, the pastries at Short Cake are worth the stop-over. Everything is not only seasonal, but top-quality and delicious. And they’re not heavy thanks to their flaky texture. It’s so easy to overlook this hidden gem, especially on the way to Short Order, but it’s so great to see great things happen here. Originally a project of the late Amy Pressman along with Nancy Silverton and Bill Chait, Short Cake remains one of most invaluable occupancies of The Original Farmer’s Market. All pastries were hosted and delicious. This entry was posted in Brunch, Food, Hancock Park, L.A., Mid-City West and tagged 3rd and Fairfax, @shortcakela, Amy Pressman, bakery, Bill Chait, breakfast, Farmer's Market, Ivan Marquez, los angeles, Nancy Silverton, pastries, Short Cake, The Original Farmers Market. Bookmark the permalink.